Sunset sailing is a staple activity in the Waikiki area, and highly recommended for first-time and return visitors to Hawaii alike. Along the shores of Waikiki Beach, dozens of catamarans and cruise boats checker the horizon, but Holokai remains a top choice for several reasons, including an open-bar policy that creates a fun atmosphere, and expansive deck space. Sailing on the Holokai Catamaran is, without a doubt, one of the best ways to enjoy the sunset in Oahu. Please Note: You will not see the Friday fireworks display on this sail. If you are looking for the Friday fireworks sail, please click here. Non-Alcoholic Drinks: Soda, Juice & Water. Honolulu passes by in a dream-like vision as the Holokai Catamaran whisks you over the Pacific waves toward Diamond Head. The fully-stocked on-board bar keeps the drinks flowing, and the orange glow of the sunset casts long shadows over Waikiki. This is what life is all about. There's no way better way to enjoy a Hawaiian sunset than on a smooth sailing catamaran cocktail sail. Waikiki shows its best side in the last shimmers of daylight. 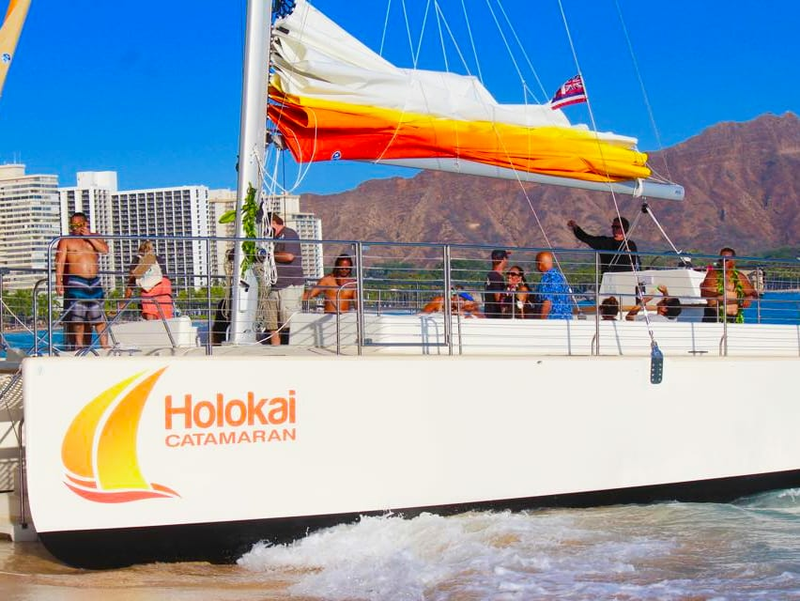 The Holokai Catamaran can be found directly behind the Outrigger Reef on the Beach Hotel, docked right on the beach. Staff will be waiting nearby to help you with the check-in process. You can't miss it! Starting January 2019, all Friday Sunset Sails will be for ages 21 and over. Wear clothing that is comfortable and appropriate for wind and the weather. A light jacket is an appropriate item to bring along. Superrrr fun will definitely recommend!!!!!!!!!!!!! One of the highlights of our trip! Great atmosphere and staff. We had 6 of us ages 22-26 and it was a blast!